Scientists have successfully transplanted a bioengineered lung into a pig. To create a new lung, experts used a “scaffold” that provided structural support and slowly built up the lung tissue around it, using cells from the pig that was due to get the transplant. This was done to prevent the lung being rejected by the pig’s immune system. Once transplanted, the lung alveolar tissue and blood vessels carried on developing for up to two months. Not only was the lung not rejected, but it even developed an important population of bacteria. Lungs suitable for transplant are in short supply and the study is a significant step forward in finding an alternative solution. “People wait for a long time on a transplant list before they are able to receive a donated lung,” said co-author Professor Joan Nichols. The transplantation of bioengineered lungs has been tried before in small animals, but these efforts have met with failure. There were problems with the blood vessels and the animals suffered from an accumulation of fluid, known as oedema. “We were able to make a much better developed vasculature in the lungs… and transplant into a larger animal with a larger lung,” said co-author Prof Joaquin Cortiella, from the University of Texas Medical Branch (UTMB) in Galveston, US. Investigators used a cocktail of sugar and detergent to get rid of all the cells and blood vessels from a lung taken from a donor pig. This left behind a support scaffold made from proteins – the lung’s “skeleton” if you like. Then, they regenerated the lung over 30 days in a piece of equipment called a bioreactor, using cells from the eventual recipient of the lung. A bioreactor is a machine that supports the development of biological tissue. If the recipient animal’s cells are used, it reduces the likelihood that the pig’s immune system will reject a transplanted organ because it recognises the tissue as its own. The key to the UTMB team’s success in getting the lung’s blood vessel development started in the bioreactor was supplying stem cells (the body’s “master cells” that are able to subsequently develop into different tissue types), but also growth factors – a molecule that stimulates cell growth, proliferation or the differentiation of cells into different types. After transplantation, they used CT (Computed Tomography) and MRI (Magnetic Resonance Imaging) scanning and measurement of gene expression to check that lung tissue and vessel growth was continuing. And they didn’t need to keep adding growth factors to make this growth happen. The technique has been successful in four pigs so far. “Given the complexity of the model, the authors should be congratulated on their approach and success to date” says Prof Hunt. When are artificial lungs needed? There are a range of conditions that may result in alung transplant beingcarried out, including chronic obstructive pulmonary disease, cystic fibrosis, pulmonary hypertension and idiopathic pulmonary fibrosis. The demand for lungs for transplant is immense and the supply just doesn’t match it, so it is often the last course of treatment action. “We could make a more standardised product that would work much better,” said Prof Nichols. This new procedure could eventually help people suffering from quite serious lung diseases. “We could take cells from people and produce an organ tissue matched to them, with no immuno-suppression needed,” she explained. How far away is this from use in humans? This advance in bioengineered lungs could increase the number of transplants – and make the transplant better. 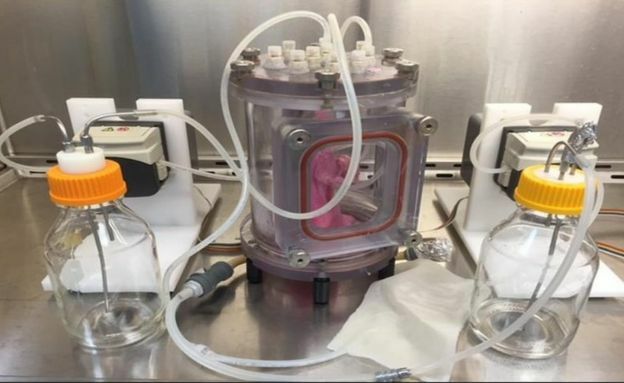 “We don’t fit donated lungs very well to how big an individual is… bioengineered lungs can be made at any time, so patients don’t have to wait until an organ is available,” Joaquin Cortiella said. “I would say somewhere around 5-10 years you will see someone actually get a bioengineered lung,” he continued. The work described in their paper is a standard part of pre-clinical testing. With enough funding, growing lungs to transplant into people in compassionate-use circumstances could become a reality. But there are some tricky challenges still to overcome: “What we really need are bioreactors that will support the development of tissues properly,” said Joan Nichols.